Fed up with wading through the mass of sales training books out there? Ace the Sale! is a no nonsense guide, uniquely written for the busy sales rep. 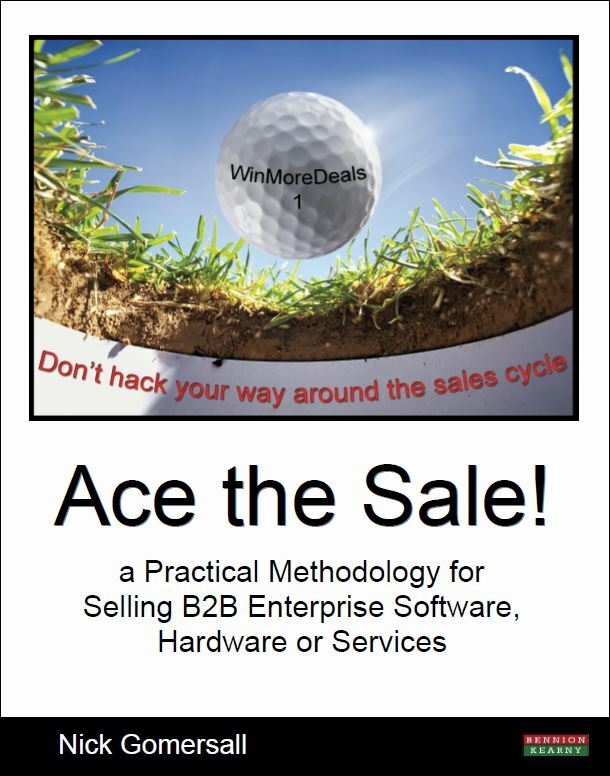 Using a golf course analogy, this book takes each hole as a must-do step in the sales cycle. There is clear instruction on everything the sales rep needs, including how to raise your Emotional Intelligence and better connect with prospects, understanding how to price deals, recognising when to ‘walk away’, what reference visits should accomplish, developing dynamic presentations skills, and much more! Based on the author’s highly successful sales career experiences, and filled with real world examples and insights – this book offers a fast track understanding for greater success in the tough but exciting world of software sales. If you are a sales rep who wants to sell more software, hardware or services more often, with higher margins, then this book is for you. Even experienced reps and managers will find valuable information that is new, provocative, even controversial, but all geared towards one thing – selling! The 7th Hole (Par 5) – How are we Doing? The 10th Hole (Par 5) – Do you need Birdies or Pars? The 12th Hole (Par 4) – Internal Selling: why is it so important? Nick Gomersall was responsible for sales in Northern Europe for JD Edwards in the mid 1990s. Selling to multi-million dollar corporations like Electrolux, Glaxo SmithKline, Disney, Johnson Matthey (and many more) taught Nick that selling at this level required a strategy to handle the many different buyers that were involved in making a decision. Using tried and tested methodology coupled with his own unique insight into selling, Nick and his team constantly hit their sales numbers. With this experience behind him Nick then turned a loss making consultancy company into one of the UK’s Times Tech 100 fastest growing companies. Using all the techniques that are in this book, Nick took a team of product consultants and turned them into one of the most effective sales forces in the market.